Christmas newsletters are a great way to entice more customers to your company during the holiday season. You can send these newsletters with warm Christmas greetings along with a pulling sneak peek of your special holiday season deals and news launches. Are you looking forward to designing Christmas newsletters? 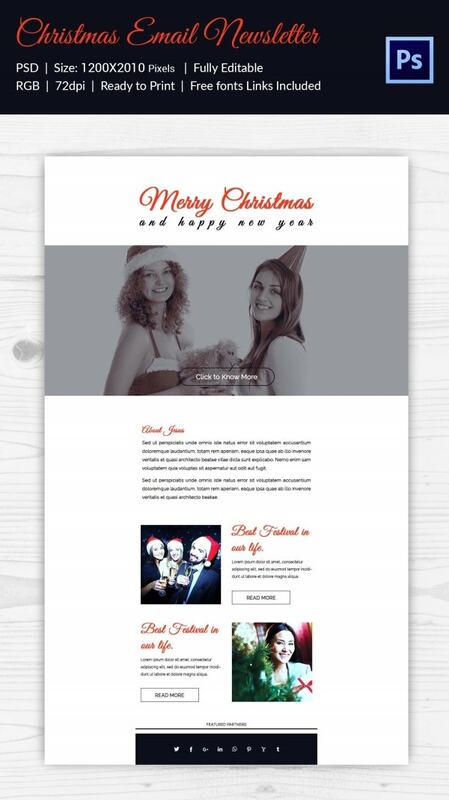 Well, you can save much of the hard work here by opting for readymade Christmas newsletter templates that come pre-designed with signature Christmas themes; they can be customized easily with your data. The silhouette of Christmas tree housing the reindeer, the warm Merry Christmas wish, and the news of the festive party- has duly set the mood of a Christmas email. There is a prominent “Visit Us” CTA button in the email. 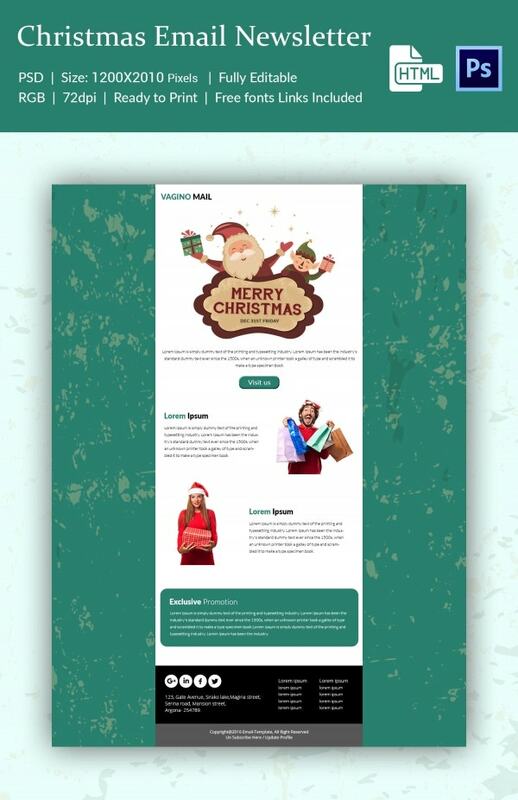 If you are looking to introduce your new tutorials this Christmas season, this Christmas newsletter template would allow you to spread the word about it with pictures and text. You are also getting sizeable space to highlight the special features of your company here. This Christmas email would be handy when you are planning to introduce special menus for the holiday season along with pictures, textual brief, and price. The template also allows you to add your social media links. 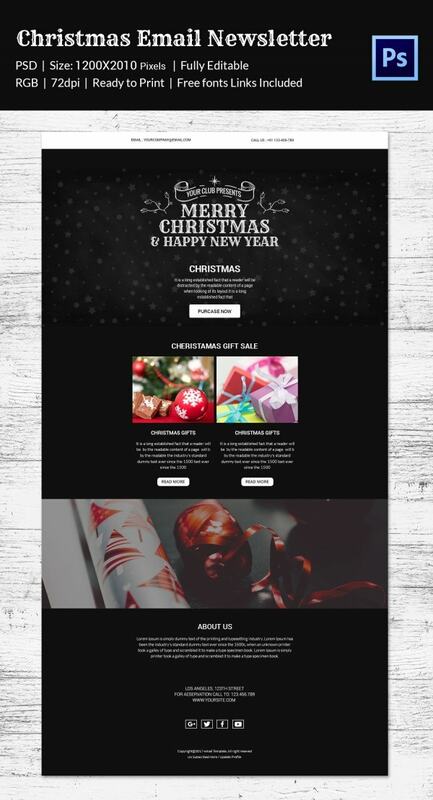 You are getting a comprehensive Christmas email newsletter template here where you can flaunt your latest products with pictures and also include brief about your company and its contact data. 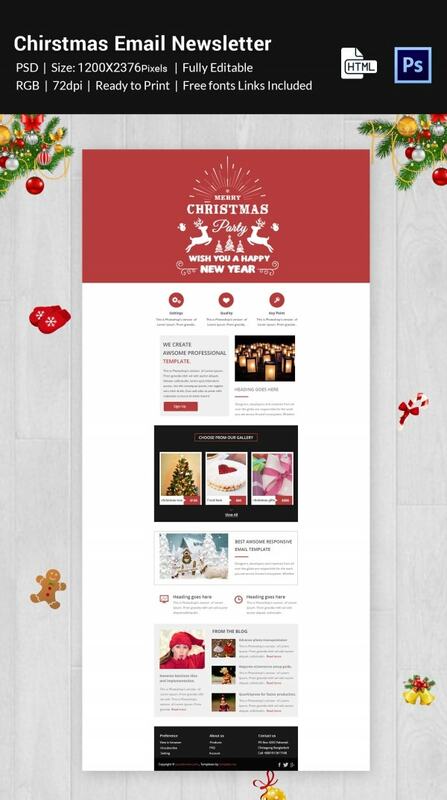 With separate blocks for different categories of information, this Christmas email newsletter template offers you a neat and smart space to talk about the different aspects of your business and website. 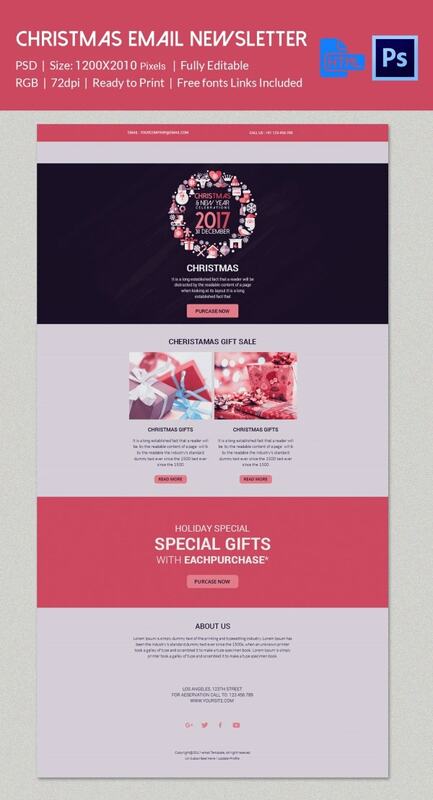 If you have plans to inform your audience about your Christmas special launches and offers, this template would be amazing. 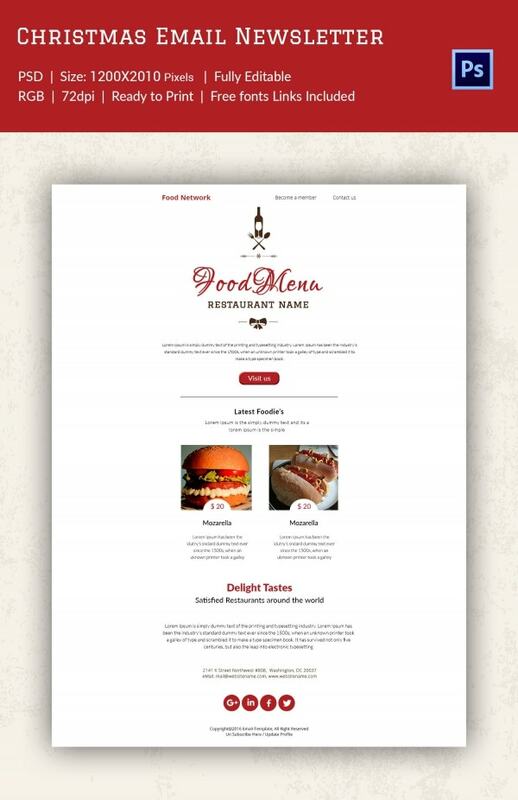 It also offers space to include important points about your store or company. 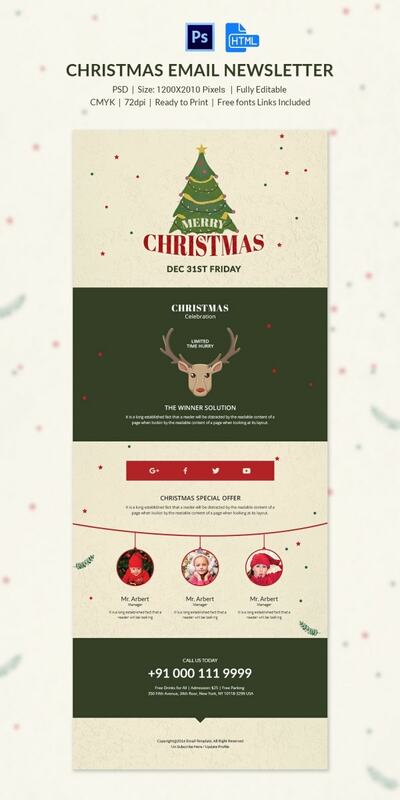 This Christmas email template captures the festive spirit with the typical Christmas elements; it would be cool if you are planning to upload a video with it. You can mention your Christmas special offer here. With big colorful banners, this email template offers you a cool space to inform your audience about your special deals and products on sale. There is an additional space to highlight about your store as well. 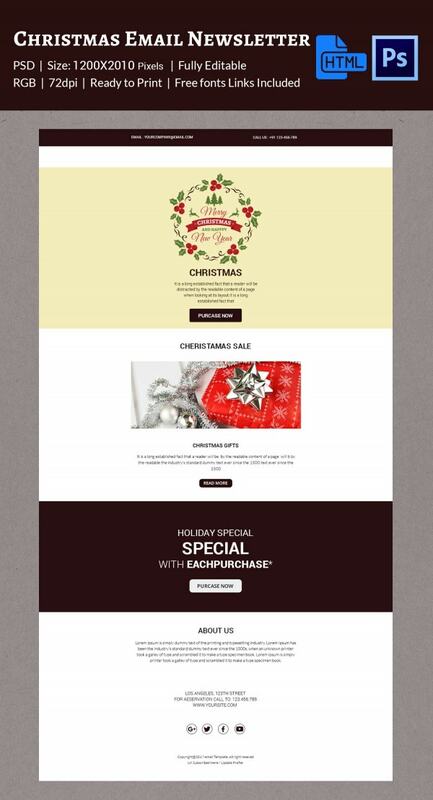 You have a neat and elegant Christmas email newsletter template here which will allow you to talk about your gala Christmas as well as New Year special gifts and offers. 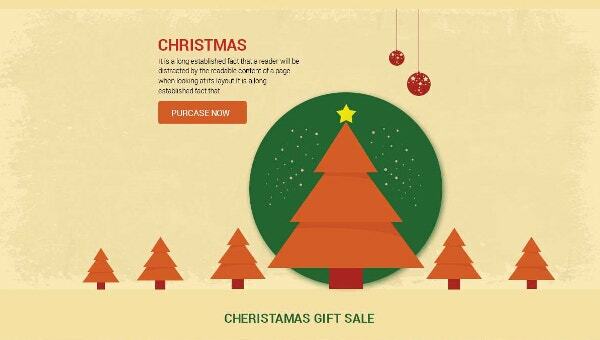 This Christmas email template has done a smart job by offering “Purchase Now” CTA buttons with every banner and you are also allowed to make the newsletter livelier with bright pictures. The starry top reminds of the great Christmas eve and hence makes an apt backdrop for your Christmas-special email newsletter. You can flaunt your latest Christmas goodies here along with pictures. 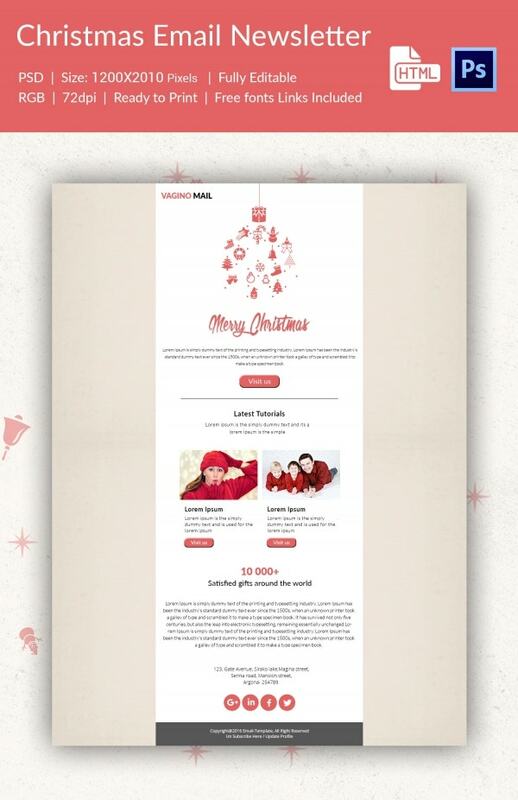 If you are looking for a Christmas email newsletter where you can spread the word about your Christmas discounts and also ask donations for noble causes, this template would be cool for you. 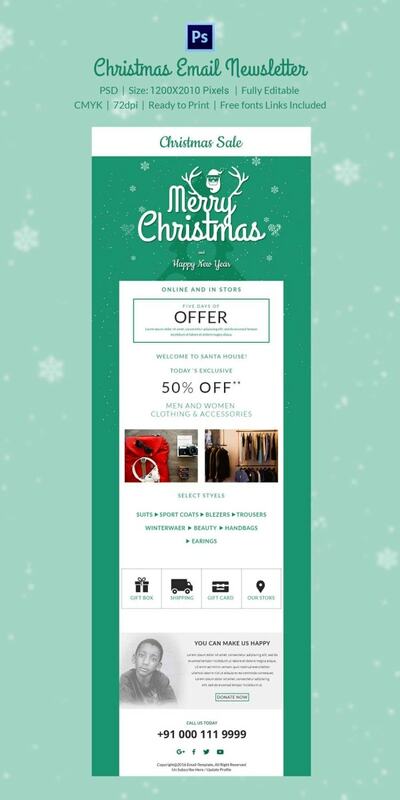 You have a cute adorable Christmas email newsletter template here which not only enables you to talk about your Christmas offers but also allows you to introduce your smart team to your audience. 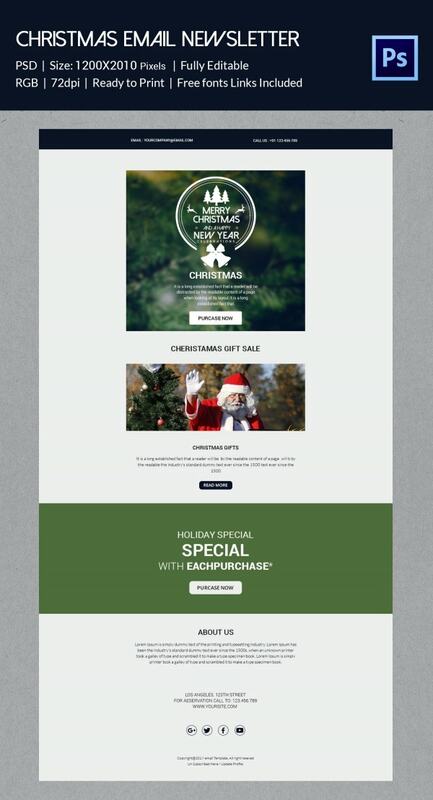 You have a simple yet elegant Christmas email newsletter template here where you can place your Christmas greetings and a pulling brief about your company, followed by a smart CTA button. 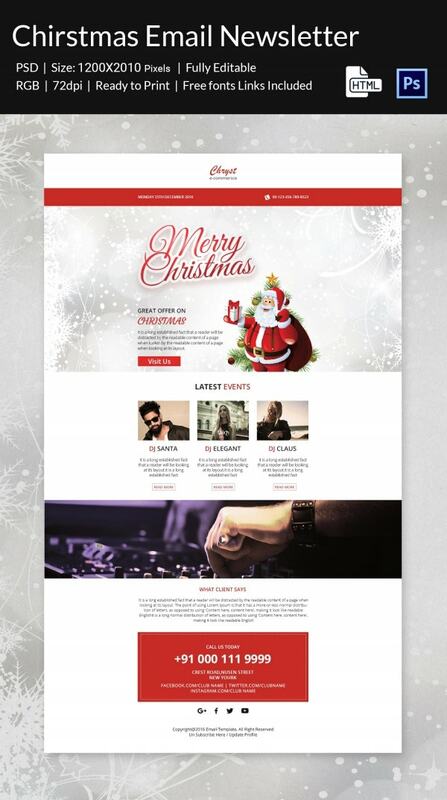 If your club is planning a special Christmas party with popular DJs, this email newsletter would be perfect for you as it has got segregated blocks to talk about those DJs along with pictures and text. 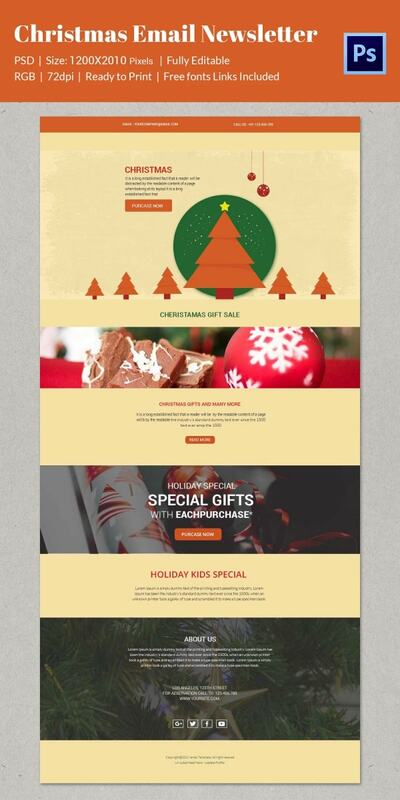 > How to use the Christmas Newsletter Templates? 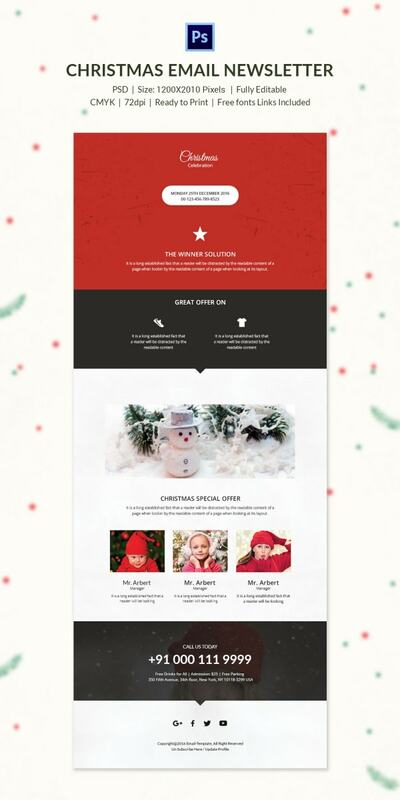 When it comes to sending Christmas wishes to your clients or potential audience, the Christmas newsletter templates are just the thing you need. You can use them for a wide range of purposes. One of them is to introduce special launches for Christmas. 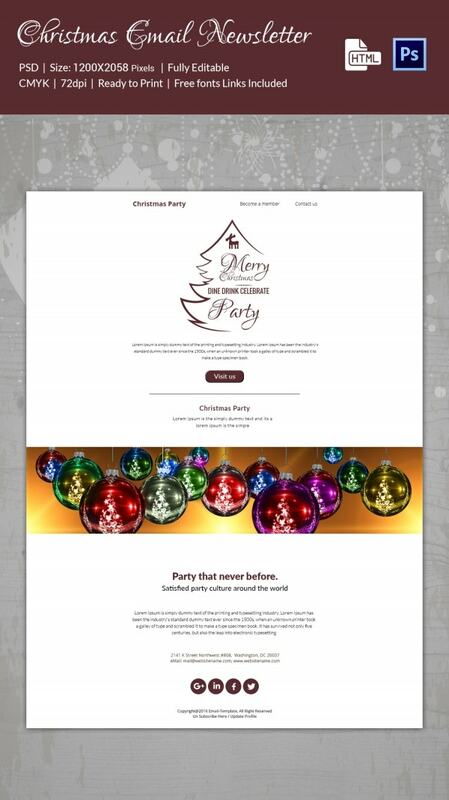 For example, if your restaurant is planning some exclusive menu for the holiday season, you can use the Christmas email templates to spread the word. Then, the Christmas newsletters would be fantastic to highlight your Christmas and New Year sale and special discounts. Some of the templates even allow you to add pictures and videos for a more engaging effect.